Titanium’s properties, which are a combination of high strength, stiffness, toughness, low density, and good corrosion resistance provided by various titanium alloys at very low to elevated temperatures, allow weight savings in aerospace structures and other high-performance applications. The atomic weight of titanium is 47.88. Titanium is lightweight, strong, corrosion resistant and abundant in nature. Titanium and its alloys possess tensile strengths from 30,000 psi to 200,000 psi (210-1380 MPa), which are equivalent to the strengths found in most of alloy steels. Titanium is a low-density element (approximately 60% of the density of iron) that can be strengthened by alloying and deformation processing. Titanium is nonmagnetic and has good heat-transfer properties. Its coefficient of thermal expansion is somewhat lower than that of steels and less than half that of aluminum. One of titanium’s useful properties is a high melting point of 3135°F (1725°C). This melting point is approximately 400°F above the melting point of steel and approximately 2000°F above that of aluminum. Titanium is not a good conductor of electricity. If the conductivity of copper is considered to be 100%, titanium would have a conductivity of 3.1%. From this it follows that titanium would not be used where good conductivity is a prime factor. For comparison, stainless steel has a conductivity of 3.5% and aluminum has a conductivity of 30%. 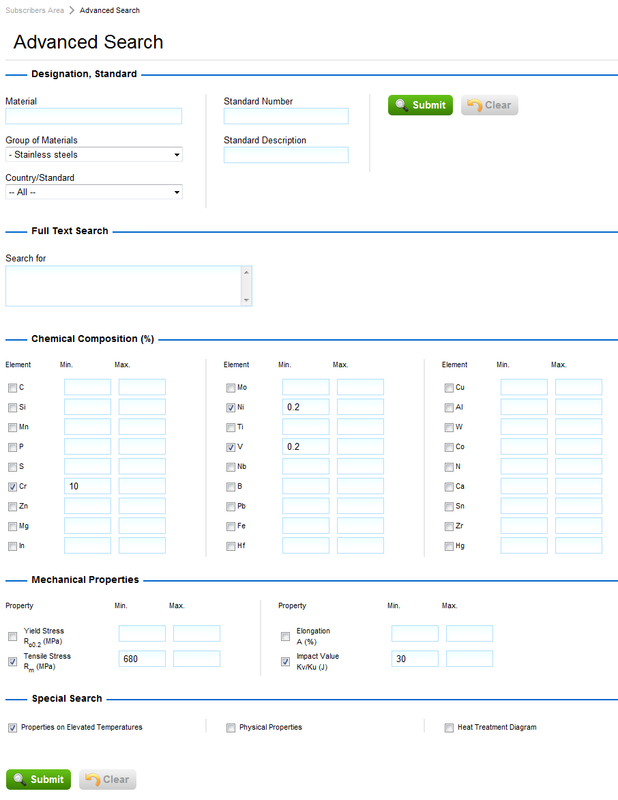 You can quickly and easily search titanium properties and alloys from all over the world by designation, countries/standards, type, standard number, chemical composition, mechanical properties, other properties or any combination of these criteria. For example, let’s look for a Chinese titanium alloy, which needs to have between 2 and 7% of Al, about 0.5% of Fe, at least 2% of Sn, minimum yield stress of 600 MPa, and minimum tensile stress of 750 MPa. Click Advanced Search from the main window. Next, choose Titanium from the Group of Materials list, China/GB from the Country/Standard list, and enter requested titanium properties and alloying elements. The search results screen appears. 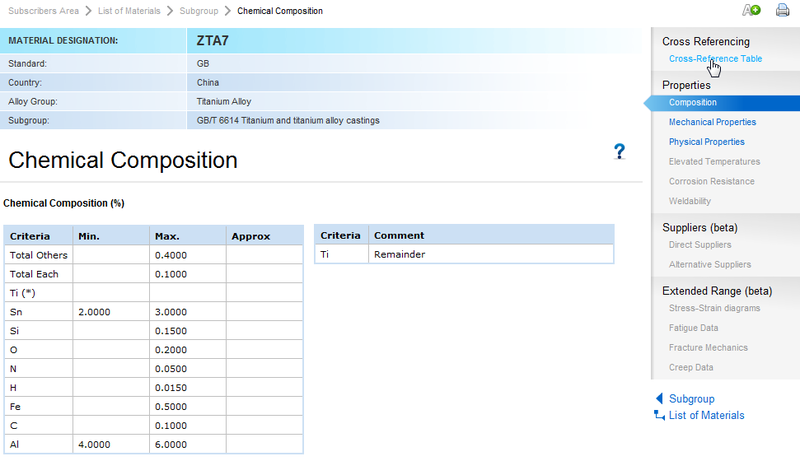 Click on a titanium alloy from the list to review its properties; in this case, the third position is selected – titanium grade ZTA7. After clicking on the material, a list of subgroups appears. In Total Materia, the term “subgroups” refers to specifications that define properties of the titanium grade; in this case the first specification is selected specification – GB 6614. Note that properties defined according to different specifications may differ significantly. Titanium properties within the Total Materia Database include composition, cross-reference tables, mechanical properties, physical properties, and more. Click on the examples below to enlarge them.